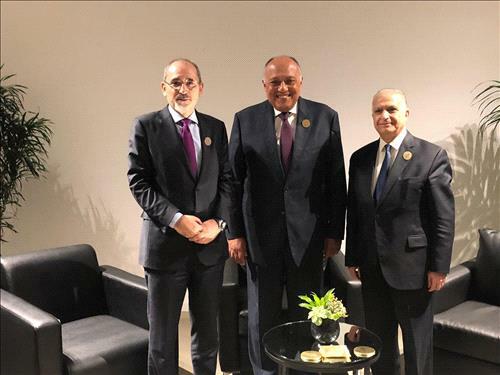 AMMONNEWS - Minister of Foreign and Expatriates Affairs, Ayman Safadi, Egyptian Minister of Foreign Affairs, Sameh Shoukry, and Iraqi Minister of Foreign Affairs, Mohamed Alhakim, on Sunday met in Beirut on the sidelines of the Arab Economic and Social Development Summit (AESD). The meeting discussed means of cooperation between Jordan, Egypt and Iraq in the fields of economy, development, trade and other sectors. They talked about the latest regional developments and means to enhance cooperation in different political issues to uphold the Arab national security, address joint Arab interests, combat terrorism and start the reconstruction process. The ministers said that they will continue meeting to increase cooperation between the brotherly countries and enhance stability in the region, as well as develop coordination in all fields.